Father’s Day takes me right back to being a little kid. I remember the hours spent making a special card and saving a little money to buy Dad something he’d really want. Except that my Dad never seemed to want anything. Oh he loved black licorice, chocolate bars and pretty much any kind of candy, but if ever there was a man hard to buy for, it was him. He wasn’t like those guys on TV or in the Sears Ads: He rarely wore slacks, he didn’t golf or fish and he certainly didn’t putter in a workshop. He worked in one but that was an entirely different matter. As a farmer, Dad worked more days than he didn’t; unless it rained, there were no days off. When everyone else took holidays, that’s when he worked the hardest. Toiling in the summer sun, he’d come in for lunch and enjoy a cold sandwich, iced tea, and a bite of pie or two. His hat would come off and he’d wash the grit and dust from his face and neck before sitting by the fan, his reading glasses on, perusing the Western Producer. Smiling at us, he’d mess our hair and ask a question or two but it wasn’t long before he was out the door again. Father’s Day usually found us all gathered at Grandma and Grandpa’s house for cake & ice cream, coffee and orange pop floats. The grown-ups would visit and we kids would mess around. Sometimes we’d all gather for a wiener roast at the local park, my mom and Aunts making extra Tang and working hard to keep the cold food cold and the hot food hot. “Your Dad is always around, dear. If you want to spend time with him, go spend time with him.” I can still see her shooing her hand at me as she said it, iron in hand, a pile of laundry behind her, and jam jars simmering on the stove. The next day, I got up extra early to find he was already gone. Rubbing the sleep from my eyes, my flip-flops padded softly down the dusty prairie trail to where he was, laying underneath the swather. I figured I could be a big help by handing him tools and stuff but I forgot to think about how hot that summer sun would soon be, beating down the back of my neck. I hadn’t considered how quickly I’d grow bore of this chore. I listened as he hummed his way through the morning, wondering aloud at what time we might break for lunch. I’m sure I was more in the way than not but, later, when he told Mom what a “big” help I’d been, my chest swelled with pride. Dad taught me that the most mundane jobs can be enjoyable with a little tune and the right attitude. When I think about what Dads teach us, it’s easy to compile a list of all he taught me: how to hold baby kittens like their Mama does, how fun it is to squirt cow’s milk at the barn cats so they stand up to reach it, how to cinch a saddle tight enough that I wouldn’t fall off but not so tight that my horse would want to bite me. Dad taught me to be gentle with living things, to have fun in my world and that being responsible brings a certain level of safety. I wasn’t strangling Tigger, I swear! Dad was the one who steadied me when the training wheels came off and he was the one who gave me a little push and yelled “you can do it” and I did. Dad taught me to stretch myself and grow. Dad made hauling manure fun! Dad was the one who reminded us girls that “too much makeup … was too much makeup” and it was always his praise we looked for when we debuted new dresses or pretty hairdos. He demonstrated gender equality by handing me things that were far too heavy for my little arms to carry; he expected me to manage it .. and I did. Dad taught me that girls could do anything but that looking like one wasn’t anything to be ashamed of, either. It was with Dad that I stopped in to check on elderly neighbors, and it was Dad who pulled teenagers cars out of the sandbars down at the lake. Dad taught me to make time for people, and that being helpful and kind are just good ways to live your life. Dad showed us where the Saskatoon berries grow the best, how to find fossils in the riverbanks and why we should leave Indian graves undisturbed. Dad taught me respect and the importance of honoring where we come from. It was Dad who taught me to dance while standing on his feet and that it was perfectly OK to make up a song and be silly once in a while. Dad taught me that laughter is part of living. 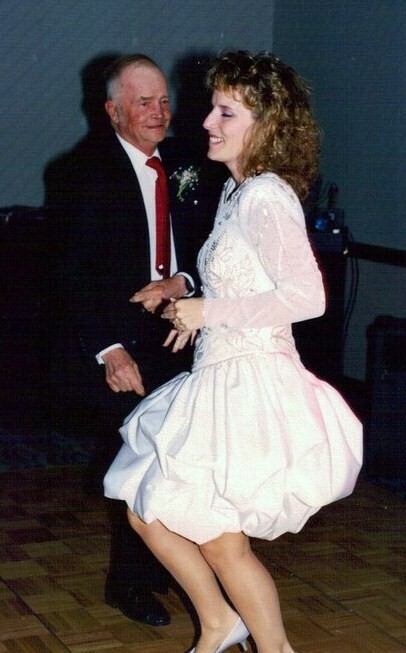 Dad & I dancing at my wedding; He was so happy! He taught us all what persistence looks like, braving rehabilitation hospitals and strangers after a series of strokes. It was Dad who taught us how to let go and that, no matter the distance, that I was still his and that he would always be mine. Dad taught me to handle what life throws at you with grace and dignity. He gave me the same look I’d given my mother, all those years ago and I gave him her answer, “Your Dad is always around, dear. If you want to spend time with him, go spend time with him.” I said this as I shooed my hand his way, a pile of laundry behind me and supper simmering on the stove. Love you, Dad, forever and for always. Happy Father’s Day in Heaven. This is wonderful, MJ. Beautifully written from your heart. My dad died when I was 8 months old. Your post reinforces what I’ve always known that I missed….. Thank you for sharing these wonderful memories. And thank you for reading; you would have enjoyed knowing him, of that I’m sure. Thanks for sharing about your dad. Sounds like a special man! He was. Thank you for reading, Tobi. What a thoughtful post! You are lucky to have been raised by a ‘salt-of-the-earth’ father who knew how to make you feel special. May all who come behind us, find us just as faithful! Keep the Faith! #1…Awesome blog…probably one of your best ever (or maybe that it’s just hitting real close to home for me this day). Again…super post. I’m certain that he’s proud of you Marilyn, for many, many reasons. Thank you, Rich. I know that it’s hitting you hard this year being your first Father’s Day without your Dad. You have that whole first year of firsts to get through and it’s not easy. Yes, Tigger was a huge orange TomCat who patrolled the yard and there were many orange kittens in the vicinity of our farm ;). 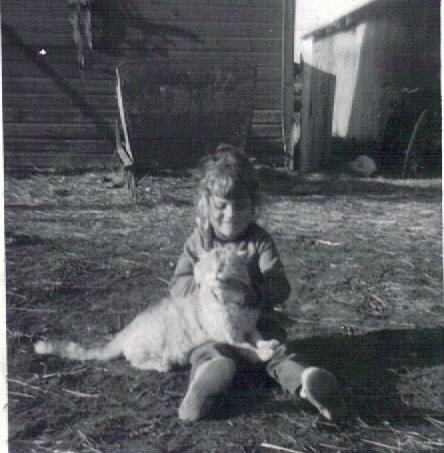 He was a big love, though, and often came to sit on my lap. I was too little to realize he took up MOST of my lap!! 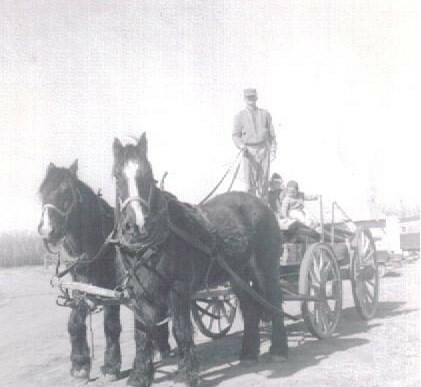 Dad had a team of Belgian mix draught horses and he harnessed them up to a wagon or other carriage-type cutters – we kids would clamor for a chance to ride along on either their shoulders or on the wagon with Dad. I can remember the sound of their harnesses and bells jangling along through the barnyard – it was the sound of Christmas to a child. I guess you already know you’ve been blessed beyond comprehension! I didn’t get the dad of my dreams till I hit 16. He made getting wood, cleaning the barn, picking up hay and ya, spreading manure fun too. Love the way you write MJ, you always seem to put us “right there” and this post was exceptional. Thank you, HRCG. 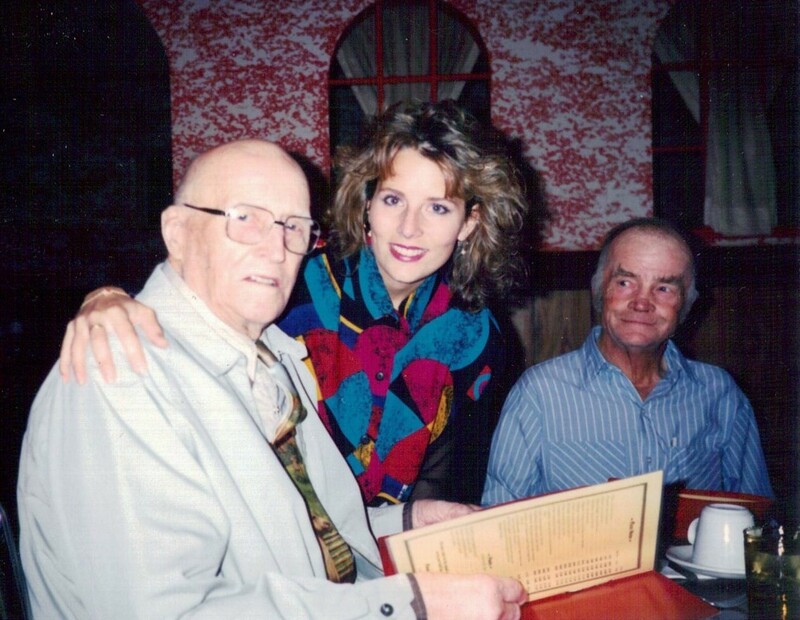 Dad was a lovely man and I miss him very much but mostly I am just grateful – grateful for the gift of a kind and loving Father. Thank you, Sheila. You are correct, so many great memories. Most of my favorites are tucked away in my mind but having a few photos in my hand makes for a sweet remembrance. That quote just summed up my Dad perfectly. Cheers to you! excellent tribute.. i always thought the best farmers were the ones who respected animals and the land. I think that’s still true today.